This Changes Everything is a multi-platform project that includes a non-fiction book by Naomi Klein, a feature documentary by Avi Lewis (premiering at TIFF 2015), public events, educational materials, a partnership with Beautiful Solutions to highlight new economy solutions, our new blog The Leap: System Change on a Deadline, and our frequently-updated Facebook and Twitter feeds. To keep in touch with the project as it unfolds, join our mailing list. For foreign translation inquiries for Naomi’s previous books, please email Claire Nozieres at Curtis Brown UK. If you are a member of a U.S. or Canadian university group and you want to bring Naomi Klein to your campus in Fall 2017 or Spring 2018, please get in touch with Naomi’s university speaking agent, The Lavin Agency. And you can read her explanation of her speaking fees here. 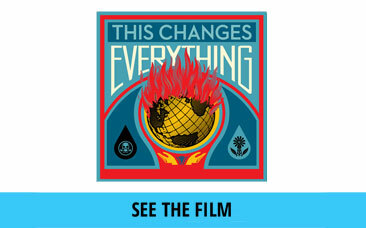 If you would like to inquire about This Changes Everything film screenings, please visit this page. For other inquiries and requests: thank you for thinking of Naomi. However, please note that we receive too many daily requests for Naomi to personally read or respond. If you would like to invite Naomi to speak with your non-profit or community group, please note she has very limited time for engagements, but email here for more information. 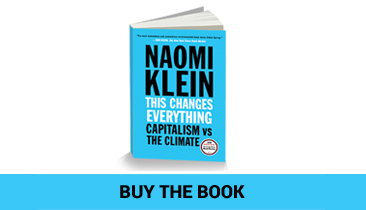 Looking for Naomi Klein’s tour dates? They’re here. Here’s the list of corrections to the first edition of the book.